The block of East 126th Street between Madison and Park Avenues was once a rare, uninterrupted row of century-and-a-half-old brownstones. But many of them sat vacant in recent years, their windows boarded up and adorned with graffiti. One of these was number 58 in the middle of the block. In 2012, its roof was caving in and its floors collapsing. The city deemed it structurally unsound, as the Times reported at the time, and slated it for demolition. Despite arguments from local preservationists that this would destroy the historic block’s uniformity, the site was replaced with a new modern, mixed-use rental building that extends through to 125th Street. 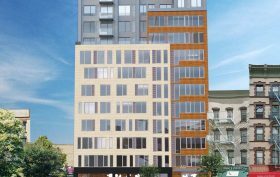 The building, which goes by 69 East 125th Street, topped off this past summer and now its 15 affordable apartments–20 percent of the total 75 rentals–are available through the city’s lottery process. They’re available to those earning 60 percent of the area median income and range from $659/month studios to $797/month two-bedrooms.